UPDATE 19th OCTOBER 2011: Updated with new file fixed to work with patch 1.26/Pets, thanks to Grant Hess's RigFix. The new file is on the Download page, with a filename beginning with PETS. The new file is NOT backwards-compatible, so if you don't have Pets or are not going to update with the 1.26 patch, please use the old version. UPDATE 13 NOVEMBER 2010: I've now installed Late Night and this bed works fine with the new vampires. You can choose to have them sleep in it instead of the Late Night coffin bed - they sleep inside it like a regular sim (just like depicted below) rather than levitating over it like they do with the Late Night beds. So you now have a choice between two different vampire beds and styles of sleeping, according to your preference. I have both beds in my vampire family's house for variety! 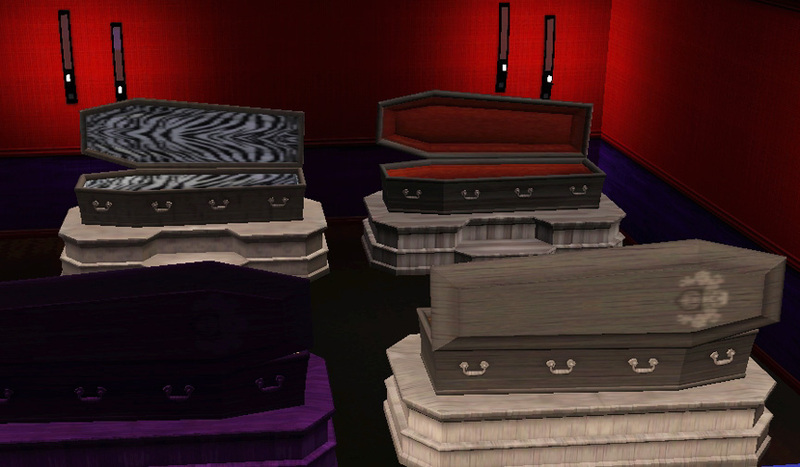 Here's a nice bed for your Vampire simmies. 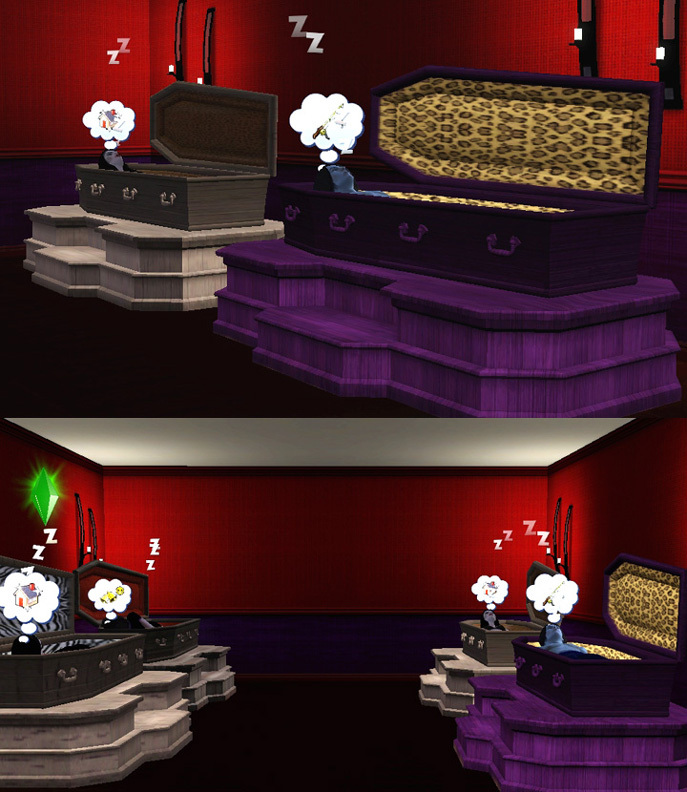 It's a conversion of the vampire coffin bed from The Sims 2. It will be found under Bedroom, Beds and costs 900 simoleons. When the sim makes the bed, their feet will clip through the platform, as seen in the first shot in the pic below. The bed must be placed against the wall or else the sim may also try to make the bed from the lid side and end up clipping through the lid as well as the platform. But it can't go directly against the wall - it must be positioned with a gap, as shown in the second shot, or else the lid will clip through the wall. Also, because there are no blankets or bedspreads, the sim's body is visible when it sleeps, and it does some pretty strange distortions with its feet and arms during sleep, so it's best not to look from above, as in the third shot. It also goes without saying that the lid doesn't close, as there is no animation for that in The Sims 3. Aside from those small points, the bed looks great and makes a really nifty resting place for your vamps. Just be sure to remove all windows in the bedroom to prevent sunlight getting in! An enormous THANK YOU to HugeLunatic for helpful advice on joint assignment for this oddball item, so that the bed would no longer disappear as soon as the sim used it! All working nicely now with no more levitating sims. Made with s3oc, S3PE and Sims 3 Object Tool. Tested with Delphy's Sims 3 Dashboard for 'Blue Lot Syndrome' and came up clean. EsmeraldaF_PETSBedVampire.zip | Description: New fixed file for pets/patch 1.26 upwards. NOT backwards compatible.